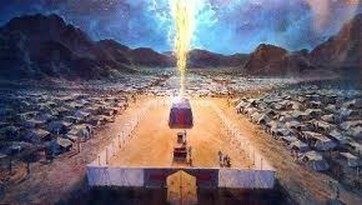 To What Temple Will the Shekinah Glory Of Messiah Return? Although the Hebrew word "Shekinah" in not found in the Bible, it is derived from and related to shakan, a biblical Hebrew (or Chaldean) word meaning to “reside,” “dwell,” “abide,” “inhabit,” “rest,” etc. Both Jews and Christians have used the word "Shekinah" throughout the centuries to describe the manifested glory and presence of God. The Rabbis often call the cloud that led the Israelites in the wilderness the Shekinah as well as the visible glory that filled the tabernacle and first temple after they were completed according the pattern. Christian scholars sometimes call the presence of God in the New Testament the "Shekinah." The Greek word parousia meaning “coming” or “presence” is sometimes related to the "Shekinah" in the New Testament. Often in congregational leadership meetings all kinds of questions are asked from, “How do we get the people to give more?” to “What color carpet should we have?” But how many times is it asked, “How do we get the Shekinah here.” It just doesn’t seem to be an important issue with most believers. Most are totally content going on with their religion whether God shows up or not, and most of the time He is not even expected to. I am not content without the presence of God. A leader's attitude should be like that of Moses. God said to Moses. My Presence shall go with you, and I will give you rest (Ex. 33:14). If Your Presence does not go with me, do not carry us up from here! For by what shall it be known that I and Your people have found favor in Your sight? Is it not in Your going with us so that we are distinguished, I and Your people, from all the other people upon the face of the earth? (Ex. 33:15-16). Moses did not want to play “church in the wilderness” (Acts.7:38) if the presence of God did not go with them. He didn’t seek the credentials of the knowledge of man with a Master’s Degree or a Ph.D. in religion. He wanted the Shekinah presence for his ID—such a unique leader! The Old Testament relates to us that only after the tabernacle and the first temple were built exactly according to the pattern, did the Shekinah glory of God fill them. In 1985 I was seeking God’s direction during a time of fasting and prayer. I was getting ready to move to Virginia. Suddenly the thunderous and awesome voice of the Heavenly Father spoke to me and commanded me, “BRING THE MEASURING ROD AND THE PLANS FOR THE TEMPLE.” Later, in another visitation, His Shekinah presence came upon me for three days. (I share this experience in my book The Breastplate of the High Priest.) I have since learned and written two books on Ezekiel’s temple showing that it is the pattern for the New Testament church. I have given my life to seeking God’s pattern and His glory. It will not fill His church in fulness until the church is built according to the plans and instructions He has given us. Most leaders don’t even have a clue that Ezekiel’s temple is the pattern of the church. They are wasting much of their time building according to their own ideas. Anything not built according to God’s desire will be burned up as hay, wood, and stubble (1 Cor. 3:12). There were no plans given for the church in the New Testament like there were for the tabernacle and temple. That is because they were given in the book of Ezekiel. THE NEW TESTAMENT CONTAINS A TEMPLE WITHOUT PLANS. THE BOOK OF EZEKIEL CONTAINS PLANS OF A TEMPLE THAT HAS NEVER BEEN BUILT. Can we connect the dots after 2000 years? We know for sure that the second coming of the Messiah will be to Ezekiel’s temple as I have shown below. The Scriptures cannot be broken; the church will be built according to the pattern of Ezekiel’s temple. Ezkiel’s temple is the Millennial Temple and the Third Day Temple. We also know the church has not yet even begun to be built according to that pattern. THE LORD WILL NOT RETURN UNTIL IT IS! And in that day His feet will stand on the Mount of Olives which faces Jerusalem on the east. And the Mount of Olives shall be split in two, from east to west, making a very large valley; half of the mountain shall move toward the north and half of it toward the south. (Zech. 14:4). And the glory of the Lord came into the temple by way of the gate which faces toward the east (Ezek. 43:4). Notice in the above verse that the Lord tells Ezekiel that this is where He will dwell with His people “forever.” We know that no earthly temple can last forever so this is one good reason that I have interpreted Ezekiel’s temple as the spiritual, New Testament temple in both books I have written on it. As you can see from the cover of my book The Church Pattern: Ezekiel’s Temple on this web site, the gospel story is built right into the dimensions that Ezekiel received. The floor plan shows a picture of the cross, tomb, and resurrection. This is another good reason that Ezekiel’s temple represents the New Testament church. A third reason is that this temple was never built during the Old Testament. A fourth reason is that the church is called a temple at least a dozen times in the New Testament. God gave Moses plans for the tabernacle in the wilderness. He gave David plans for the Old Testament temple. We would expect some plans for the New Testament temple. These nine chapters that contain the plans for the New Testament temple are usually totally ignored by church builders, leaders and pastors. They are all building according to their own ideas and plans while ignoring God’s will and plans. You would be hard pressed to find even one church that is implementing the instructions for church found in the New Testament let alone trying to fit them into the context of Ezekiel’s temple. To call the church a temple at least a dozen times is very significant. It is at least worth a cursory glance through the Bible to see if we can find plans for some mysterious temple that was never built during Old Testament times. Sure enough, there they are at the end of the book of Ezekiel. The reason it was never built in the Old Testament is that no one of that time could figure it out. The laws in it did not line up with the Old Testament laws. So they left if for us New Testament folks. But we were not interested in building God’s temple either. The question that rings in my mind and heart is WHY? Why are so few leaders interested in God’s will, desire, and pattern? One reason is, like the Pharisees, most leaders would have too much money, prestige, and glory of man to lose to accept God’s will and plans. God have mercy on them. And the Lord, whom you seek, will suddenly come to His temple (Mal. 3:1b). And what agreement has the temple of God with idols? For you are the temple of the living God (2 Cor. 6:16). The next time someone tells you that the Lord is going to return soon, tell them, “Not until the church is built according to the pattern of Ezekiel’s temple.” Only when the temple is built according to the pattern will the Shekinah return. Then we will have a congregation where it is said, “The Lord is there” (Ezek. 48:35).